Moodle is a powerful learning management system which is widely used in the academic niche to build online course management and e-learning websites for universities and institutions around the world. Moodle is a free and open-source software learning management system written in PHP. It is mostly used by educational websites because it provides customizable management features. Its functionality can be extended by using community sourced plugins. This platform is in continual evolution and you should definitely take it into consideration if you want to build an online courses/educational business. If you’re looking for Moodle themes with a focus on interaction and collaborative construction of content, this list will surely help you. 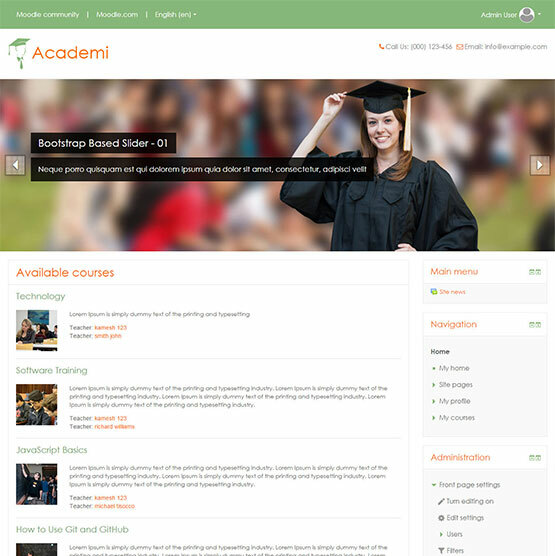 Most of these Moodle themes are premium, but we added a couple of free ones as well. Check them out! Edwiser RemUI is an awesome Moodle theme that completely transforms Moodle’s default look into a modern and user-friendly design, both on the back-end and front-end. Learning is a clean and simple Moodle theme. It has all the features needed to build a successful online courses website. Shiksha Moodle Theme is a 100% responsive, feature heavy and clean Moodle theme. Shiksha is designed to break free of the strict design restrictions imposed by the rigid framework of Moodle. It provides 16 customizable sections for you to play with. Besmart is a clean and simple Moodle theme with a huge list of settings for complete customization and Bootstrap grid and features. With this great theme you can choose your own theme color set, set the page layout and customize the site logo from 3 available options. Squared is a free theme that comes with a square design. This theme will give your Moodle website a beautiful and modern look. Simpledark is a responsive Moodle theme with an elegant layout, just perfect for any kind of online courses. This theme has a frontpage layered slideshow, frontpage marketing spots, client marketing spots, unique grid based course listing and more awesome features you can use. Education Moodle theme comes with Bootstrap grid and features, social media icon settings, custom styles for icon boxes, and more. This responsive Moodle theme has a lot of goodies for you to play with. It has Font Awesome icons, Bootstrap grid, custom CSS area, and more. This theme is fully customizable, has unlimited color options and all the features you need in order to launch a successful online courses website. This theme has many features you can use, such as background banner image settings for internal pages, custom styles for testimonials, custom styles for pricing tables, custom styles for icon boxes, and more. 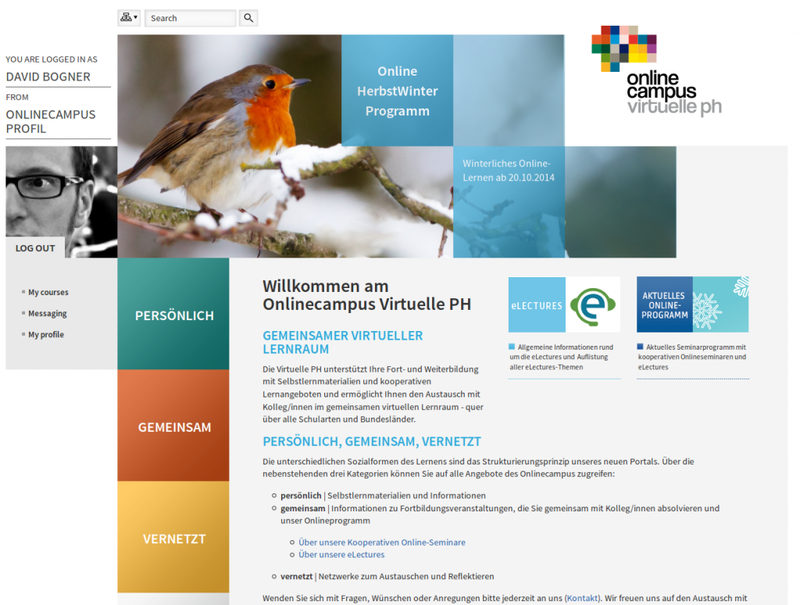 Use this theme and start building your education/courses website today. It offers all the features you need in order to launch it quickly and customize it easily. IT- Solution is a clean and simple Moodle theme with responsive design and a ton of cool features you can customize. Customize the colors, sliders, content, everything in this Moodle theme! It has a ton of settings you can modify. Roshni Moodle Theme is a 100% responsive theme with TinyMCE HTML Editor, 2 sliders, flexible Moodle blocks, unlimited fonts, support of Font Awesome, and many more similar features. This great theme comes with customizable sections on the front page which the user may customize through a backend settings panel. Customize this theme as you please. Choose your own theme color through color picker, set the desired page layout, place own logo, and more. Add new custom pages, change colors and fully customize this premium Moodle theme as you please! This free Moodle theme features a responsive layout, is compatible with Moodle 2.6, 2.7,2.8,2.9,3.0, has many typography styles and it makes it extremely easy to manage slider images and text and description. 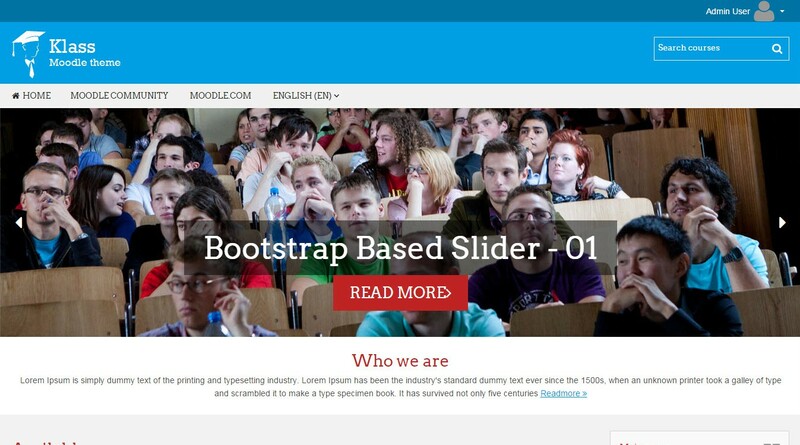 This free Moodle theme has Twitter Bootstrap accordions , dropdowns , tabs, a front page customized site news block, course categories blocks, and more great features. I would like to bring to your notice a brand new Moodle theme Edwiser RemUI which transforms the user experience of existing Moodle. It has bold colors to choose, responsive sidebars, dashboard layout containing widgets or blocks which give relevant information about Moodle site certainly something that would benefit all Moodle users. Do have a look at the demo to know more about it. Kudos to the round up of free & premium Moodle themes. A theme which has transformed the user interface of existing Moodle and improved the overall User experience of Moodle. Vastly different from to existing Moodle themes.